Itemis-glen-1319 - Mrs. May Jones receiving Masters Degree, Calgary, Alberta. Itemis-glen-1320 - Salvation Army citadel in downtown Calgary, Alberta. Itemis-glen-1321 - Sheep sheltered from the wind, Calgary, Alberta. Itemis-glen-1322 - McDonald's is busy, Calgary, Alberta. Itemis-glen-1323 - Fuddle Duddle stickers abound in Calgary, Alberta. Itemis-glen-1324 - Architect explaining his model of proposed Civic Centre, Calgary, Alberta. Itemis-glen-1325 - Counseling by Doctor Roy Ferguson, Calgary, Alberta. Itemis-glen-1326 - People dancing at the New York, New York Disco, Calgary, Alberta. Itemis-glen-1327 - Civic Centre model, Calgary, Alberta. Item is-glen-1323 - Fuddle Duddle stickers abound in Calgary, Alberta. 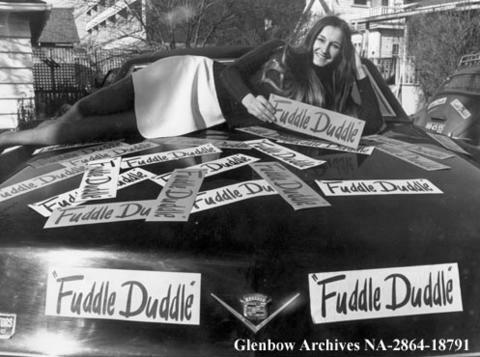 Fuddle Duddle stickers abound in Calgary, Alberta.